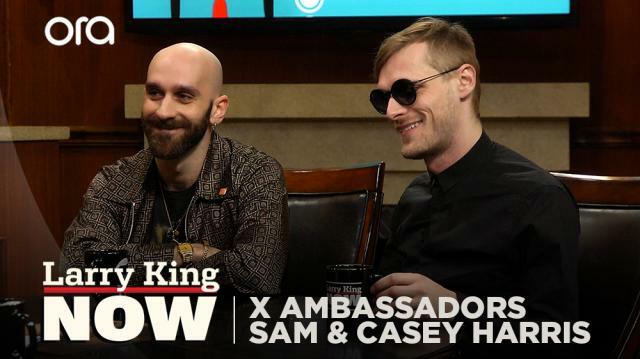 In the wake of the shooting massacre in Parkland, Florida, rock band X Ambassadors lend support the courageous kids across the country fighting for increased gun control measures in America. Larry King: Okay, you guys have used your platform to speak out on many social and political issues. Always that way, were you? Sam Harris: Yeah, I mean, I don't see any other choice, especially for us being in the position that we are, having any sort of a voice with any group of people who are listening to us and what we have to say. Yeah, it never seemed like there was any other option. Larry King: You've been strong on gun control. Sam Harris: Yeah. I'm wearing actually, right now I'm wearing a pin for Every Town for Gun Safety, which is an incredible organization that we've done some work with. Larry King: What do you make of these amazing kids in Florida? Casey Harris: They are so incredible. Larry King: I knew this would be different. This is gonna change things. Casey Harris: And a lot of it is credit to the kids themselves who have taken it into their own hands and taken it upon themselves to, they took a several hour trip to Washington to petition the President and Congress. Larry King: And they got the march, parade. Casey Harris: They've got the march. I hope, I hope and I pray that this time, with their power and their passion, that there will be some changes. Sam Harris: I think when you're young, when you're that young, when you're that age, it doesn't even seem, again, it's like, okay, people are dying. People are dying. Casey Harris: We have to do something. Sam Harris: Choice. It's very black and white with the way that you operate at that age. It's like, all right, something needs to be done. Let's do it. Larry King: You're in our thoughts and prayers. Casey Harris: Prayers and thoughts are powerful, but they're no replacement for action. Casey Harris: They're words, exactly.